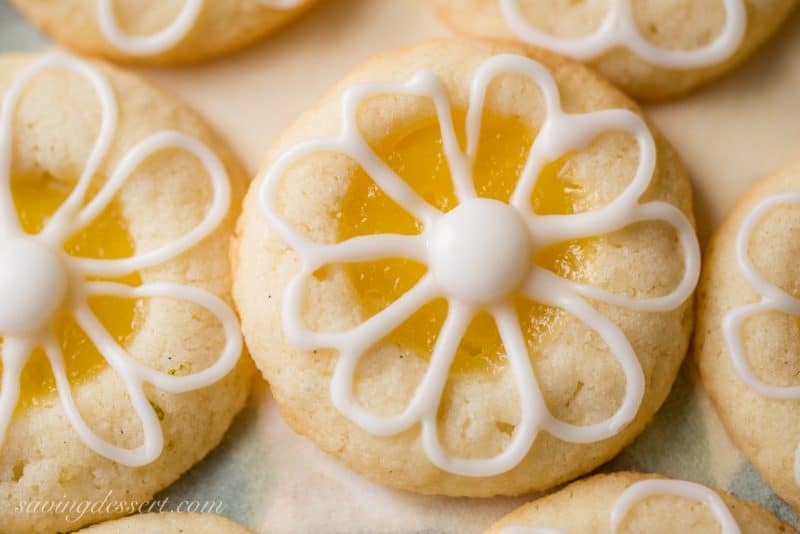 Lemon-Lime Shortbread Thumbprint Cookies – a Lime infused Shortbread Cookie filled with homemade Lemon Curd and topped with a simple Lime Icing – a bright summer treat! We have out-of-town company this week and had a family get-together to grill out and show off both our new grand-babies. I made these cookies to serve for dessert and they were a big hit. When I finally got around to asking if anybody liked the cookies (required taste-tester feedback) I was told that our son had already eaten about 10 of them! Apparently he really liked them! 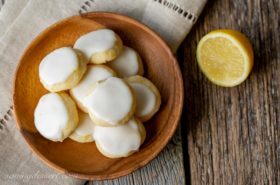 These cookies have a bright lemony flavor similar to a great lemon bar, or slice of lemon ice box pie. The simple shortbread dough is made with just a few ingredients then rolled into 1-inch balls. Try not to flatten the cookies with a big thumbprint, but instead make a hole straight down into the dough. Fill each with the lemon curd and bake! A simple icing is made with fresh lime juice and confectioners’ sugar and drizzled on top for that little something extra. I piped the icing on with a pastry bag and decorating tip but it’s not necessary. You can use a small baggie with a tiny hole cut in the corner and give it the traditional thumbprint zig zag pattern. I thought the flowers look like summer – bright and sunny! Lemon and lime are a great combination but you could use all lemon and they would be just as good. The cookie dough is not overly sweet so the addition of jam or lemon curd seals the deal. 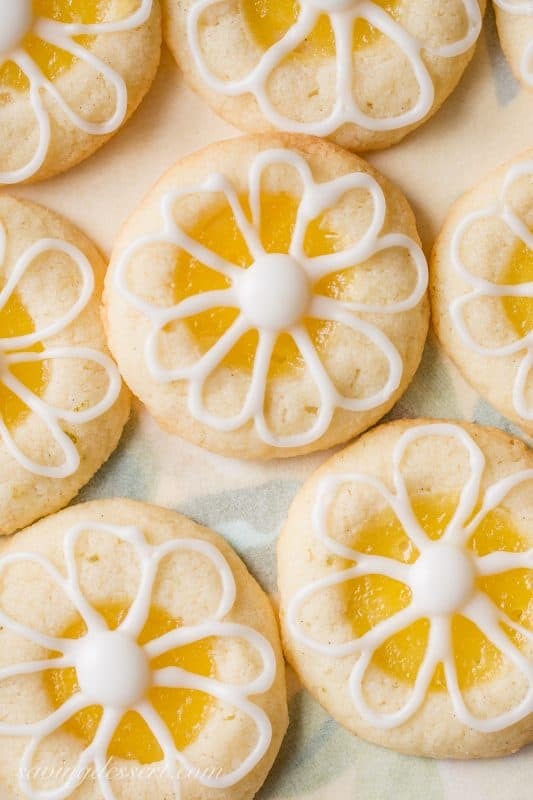 These cookies can be made with your favorite jam or try our easy recipe for homemade Lemon Curd. A lime infused shortbread cookie filled with homemade Lemon Curd and topped with a simple lime icing - a real summer treat! Combine the butter, granulated sugar, vanilla bean paste, salt, lime zest and the juice of 1/2 a lime in a large mixing bowl. Beat on medium speed until the mixture is creamy. Scrape down the sides of the mixing bowl with a spatular and blend again. Reduce the speed to low and add the flour in 3 parts. Scrape the sides and blend another 30 seconds. Cover the mixing bowl and refrigerate the dough for 1 hour. Preheat oven to 350 degrees. Line a baking sheet with parchment paper. 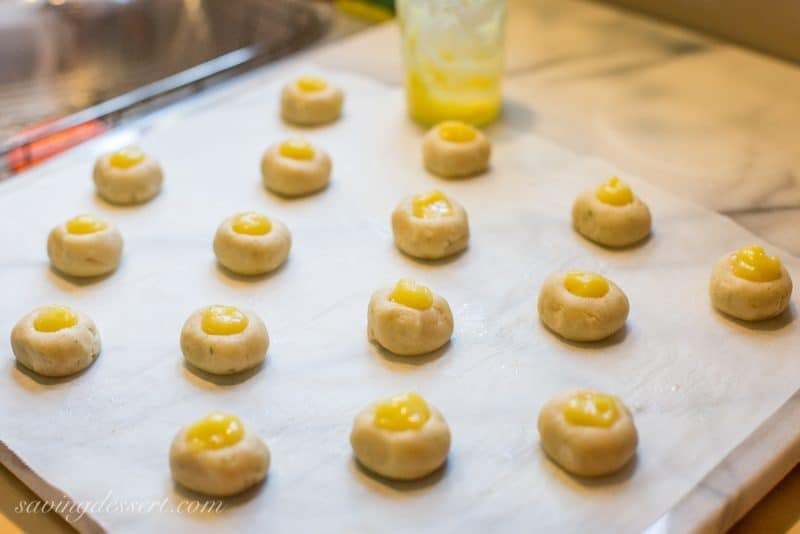 Shape the dough into 1-inch balls and place 2-inches apart on the prepared pan. Make an indention in the center of each cookie with a small finger - pushing straight down trying not to flatten the dough ball. The edges of the dough may crack slightly. Push the cracked dough back together to make a smooth ball. Filled each ball with a heaping 1/4 teaspoon of lemon curd. Bake for 15 minutes or until the edges are lightly browned. Remove from the oven and allow the cookies to rest on the pan for a minute or two before transferring to a cooling rack. Cool completely before icing. For the glaze combine the 1 cup powdered sugar and the juice of 1/2 lime and whisk until smooth. Thicken or thin as desired and drizzle over cooled cookies. Allow the icing to fully set then refrigerate leftovers. NOTE: When making the indention for the lemon curd, use a small finger and push straight down, but only about halfway. Do not smash the dough and flatten it out. DO NOT MAKE THE INDENTION TOO DEEP. The deeper the whole, the wider the cookies will spread. Feel free to omit the lime and use lemon zest and juice instead. Homemade Lemon Curd is very simple to make and delicious served on pound cake, angel food cake, muffins, biscuits or scones. And finally, we’re off to do the sight-seeing thing in the Washington D.C. area. We love to entertain our guests with the amazing history of the area. There is so much to do from small town antiquing in Virginia, touring civil war battlefields, visiting the homes of the many presidents from Virginia, and all the way to the museums and monuments of Washington D.C. Happy Monday! Glad the second batch turned out okay for you Sara. These cookies have a great flavor and terrific texture. Not sure what happened and it seems odd that you had to flatten them. Thanks for the feedback. I don’t usually comment on recipes, but after making these cookies for my sister’s bridal shower, I had to. These are DELICIOUS! They turned out as good as I had hoped. Great directions. I will be making them again… SOON! Thank you so much for taking the time to comment Katie – it made my day! I love these little cookies and so glad you did too. Thanks again – it’s readers like you that make it worth the effort! In the process of baking off the last of the dough I made for these. The flavor’s good, but I will say I don’t understand how you got the flat cookies in the photos using the method of indenting them described in the recipe. I followed it to a T, and my first batch -using my pinky and pushing straight down- came out more rounded and domed. The second batch was better because I did the more traditional slight-finger-squish method, but they’re still not like the photos. This third batch I wound up actually flattening them into little pucks and then indenting with my finger, so hopefully at least those come out with a more workable surface area for the flower frosting. Overall, it’s a good shortbread cookie recipe -I’ve already eaten like five- but as far as thumbprints go, shortbread doesn’t really spread a lot so you have to flatten the balls and do a bit of a squish with your index finger. Thank you so much Cait! My son was talking about these cookies yesterday – he wanted to know when I will make them again! Thank you so much for the feedback and the comment. Have a lovely week! We eat first with our eyes…..These are SO pretty! 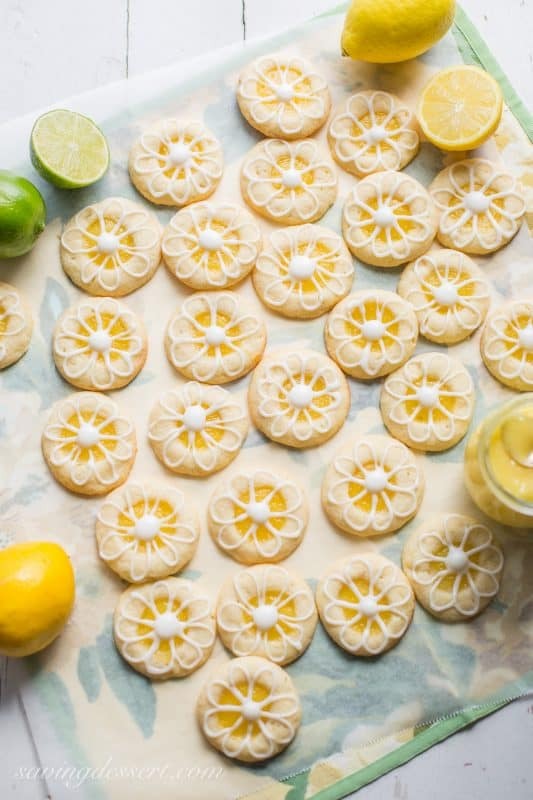 Then with our mouths…..lemon-lime shortbread with a glass of iced tea= summertime heaven! These cookies really are special, Tricia! Thank you very much Wendy – they were really good and enjoyed by all! Who wouldn’t dive into these? I love cookies and these are such happy cookies I have no doubt they would love me back! Hope you had a great day sightseeing! The sightseeing goes on all week Abbe – we may need more cookies – haha. Thanks for stopping by! You could be a professional cookie-decorator, Tricia! They are beautiful! But pretty isn’t everything – they look delicious too. Aww thank you Susan! The taste is pretty great but my decorating skills need work 🙂 Lemonlicious! Thanks Greg! Hope you’re having a great summer. Lemon always does it for me. And with shortbread? Heaven! This looks just outstanding — thanks. Those are the cutest cookies ever, they could be in a bakery in Germany or France. These are the prettiest cookies I have seen. Gorgeous! Thanks Mandy – you too! Fantastic! The flower shaped icing looks way too adorable! Thanks Angie – they were very fun to make. These cookies are so adorable and I am in awe of your piping skills! Thanks Sara – but they are far from perfect 🙂 However, they are pretty tasty! You are right Monica – making your family and children happy with something delicious always makes my day. 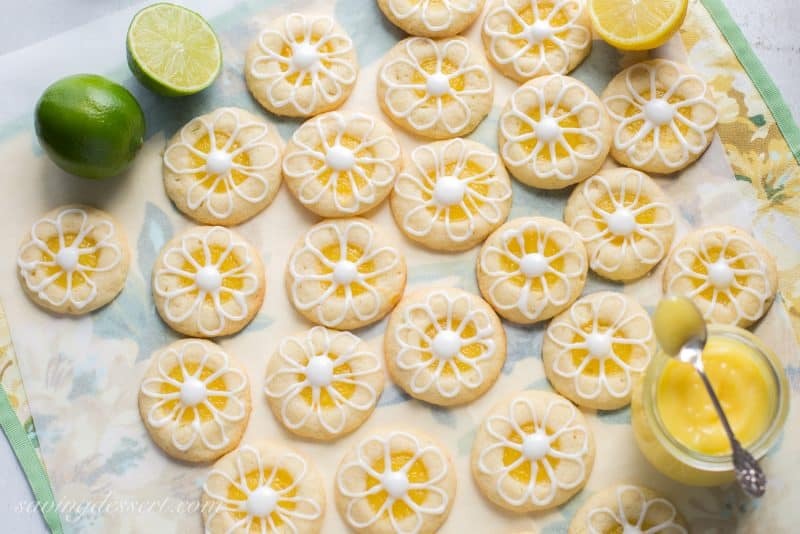 These cookies are so pretty and perfect for entertaining. Love that they are so summery and fun. Have a fun time entertaining! 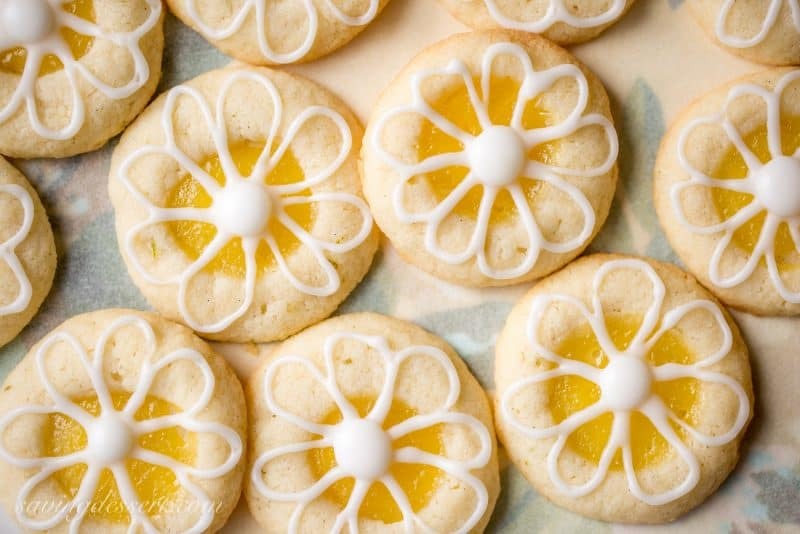 They are very summery with a bright lemon flavor. They disappeared very quickly – for which I was grateful and didn’t have to eat them all! So bright and sunny! Perfect summer cookies. I love that you filled them with lemon curd! Thanks Liz – they really turned out delicious! These HAVE TO BE AMAZING, Tricia!!!! 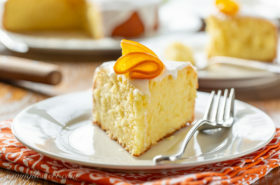 LEMON is WONDERFUL in desserts!!! I also PINNED THIS to my Pinterest board! 😉 (Just started that!) 😉 THANKS TRICIA!!! Thanks for pinning the cookies Becky – I know you’re going to love Pinterest – once you figure it all out you’re going to love it! Simply adorable! 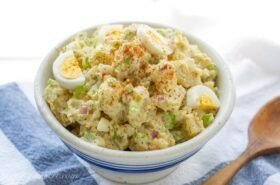 And I have used that recipe from LOL many times and know that it’s crazy delicious in addition to being so easy! What a great adaptation Tricia. Thanks Chris – gotta love a good shortbread recipe! I laughed when you said your son gobbled them up because that’s the first idea that came into my head when I saw these and I’m not even a ‘sweets’ person, lol. These are so beautiful. I love the intricate work! I simply can’t get enough of this gorgeousness! So awesome! Thanks Katherine – they are absolutely wonderful! I have Myer lemon marmalade. 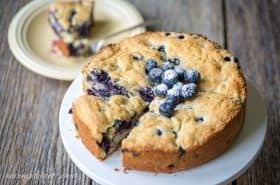 Would I have to put it in the thumbprint after it bakes? Wondering if it will melt. I am guessing lemon curd has eggs so the heat wont melt it. Hi Janet – I think it will be fine and will probably melt just like jam or jelly. Don’t overfill the pocket or make the hole very deep. It will cause the cookies to spread too much. I would be more inclined to use 1/4 tsp of the marmalade then maybe add a little more on top after they are baked, but still warm. Hope that helps. 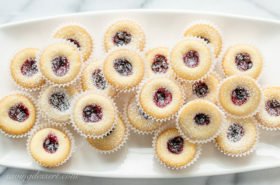 The sugar in the jam / jelly causes the cookies to spread – I would test a few first before making a whole pan of cookies. Good luck and no doubt they will be delicious!